Private equity, in finance, is an asset class consisting of equity securities in operating companies that are not publicly traded on a stock exchange. Private equity investments are primarily made by private equity firms, venture capital firms, or angel investors, each with their own set of goals, preferences, and investment strategies, yet each providing working capital to a target company to nurture expansion, new product development, or restructuring of the company’s operations, management, or ownership. Among the most common investment strategies in private equity are: leveraged buyouts, venture capital, growth capital, distressed investments and mezzanine capital. In a typical leveraged buyout transaction, a private equity firm buys majority control of an existing or mature firm. This is distinct from a venture capital or growth capital investment, in which the investors (typically venture capital firms or angel investors) invest in young or emerging companies, and rarely obtain majority control. Leveraged buyouts involve a financial sponsor agreeing to an acquisition without itself committing all the capital required for the acquisition. To do this, the financial sponsor will raise acquisition debt which ultimately looks to the cash flows of the acquisition target to make interest and principal payments. Acquisition debt in an LBO is often non-recourse to the financial sponsor and has no claim on other investment managed by the financial sponsor. Therefore, an LBO transaction's financial structure is particularly attractive to a fund's limited partners, allowing them the benefits of leverage but greatly limiting the degree of recourse of that leverage. 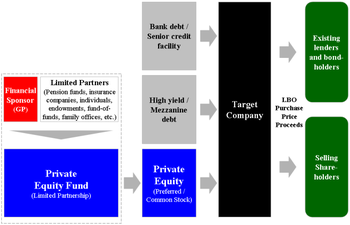 This kind of financing structure leverage benefits an LBO's financial sponsor in two ways: (1) the investor itself only needs to provide a fraction of the capital for the acquisition, and (2) the returns to the investor will be enhanced (as long as the return on assets exceeds the cost of the debt). As a percentage of the purchase price for a leverage buyout target, the amount of debt used to finance a transaction varies according the financial condition and history of the acquisition target, market conditions, the willingness of lenders to extend credit (both to the LBO's financial sponsors and the company to be acquired) as well as the interest costs and the ability of the company to cover those costs. Historically the debt portion of a LBO will range from 60%–90% of the purchase price, although during certain periods the debt ratio can be higher or lower than the historical averages. Between 2000–2005 debt averaged between 59.4% and 67.9% of total purchase price for LBOs in the United States. Venture capital is a broad subcategory of private equity that refers to equity investments made, typically in less mature companies, for the launch, early development, or expansion of a business. Venture investment is most often found in the application of new technology, new marketing concepts and new products that have yet to be proven. Venture capital is often sub-divided by the stage of development of the company ranging from early stage capital used for the launch of start-up companies to late stage and growth capital that is often used to fund expansion of existing business that are generating revenue but may not yet be profitable or generating cash flow to fund future growth. Entrepreneurs often develop products and ideas that require substantial capital during the formative stages of their companies' life cycles. Many entrepreneurs do not have sufficient funds to finance projects themselves, and they must therefore seek outside financing. The venture capitalist's need to deliver high returns to compensate for the risk of these investments makes venture funding an expensive capital source for companies. Being able to secure financing is critical to any business, whether it’s a startup seeking venture capital or a mid-sized firm that needs more cash to grow. Venture capital is most suitable for businesses with large up-front capital requirements which cannot be financed by cheaper alternatives such as debt. Although venture capital is often most closely associated with fast-growing technology and biotechnology fields, venture funding has been used for other more traditional businesses. Growth Capital refers to equity investments, most often minority investments, in relatively mature companies that are looking for capital to expand or restructure operations, enter new markets or finance a major acquisition without a change of control of the business. Companies that seek growth capital will often do so in order to finance a transformational event in their life cycle. These companies are likely to be more mature than [venture capital] funded companies, able to generate revenue and operating profits but unable to generate sufficient cash to fund major expansions, acquisitions or other investments. Because of this lack of scale these companies generally can find few alternative conduits to secure capital for growth, so access to growth equity can be critical to pursue necessary facility expansion, sales and marketing initiatives, equipment purchases, and new product development. The primary owner of the company may not be willing to take the financial risk alone. By selling part of the company to private equity, the owner can take out some value and share the risk of growth with partners. Capital can also be used to effect a restructuring of a company's balance sheet, particularly to reduce the amount of leverage (or debt) the company has on its balance sheet. A Private investment in public equity, or PIPEs, refer to a form of growth capital investment made into a publicly traded company. PIPE investments are typically made in the form of a convertible or preferred security that is unregistered for a certain period of time. The Registered Direct, or RD, is another common financing vehicle used for [growth capital]. A registered direct is similar to a PIPE but is instead sold as a registered security. "Special Situations" or "Turnaround" strategies where an investor will provide debt and equity investments, often "rescue financing" to companies undergoing operational or financial challenges. In addition to these private equity strategies, hedge funds employ a variety of distressed investment strategies including the active trading of loans and bonds issued by distressed companies. Mezzanine capital refers to subordinated debt or preferred equity securities that often represent the most junior portion of a company's capital structure that is senior to the company's common equity. This form of financing is often used by private equity investors to reduce the amount of equity capital required to finance a leveraged buyout or major expansion. Mezzanine capital, which is often used by smaller companies that are unable to access the high yield market, allows such companies to borrow additional capital beyond the levels that traditional lenders are willing to provide through bank loans. In compensation for the increased risk, mezzanine debt holders require a higher return for their investment than secured or other more senior lenders. Secondary investments refer to investments made in existing private equity assets. These transactions can involve the sale of private equity fund interests or portfolios of direct investments in privately held companies through the purchase of these investments from existing institutional investors. By its nature, the private equity asset class is illiquid, intended to be a long-term investment for buy-and-hold investors. Secondary investments provide institutional investors with the ability to improve vintage diversification, particularly for investors that are new to the asset class. Secondaries also typically experience a different cash flow profile, diminishing the j-curve effect of investing in new private equity funds. Often investments in secondaries are made through third party fund vehicle, structured similar to a fund of funds although many large institutional investors have purchased private equity fund interests through secondary transactions. Sellers of private equity fund investments sell not only the investments in the fund but also their remaining unfunded commitments to the funds. Real Estate: in the context of private equity this will typically refer to the riskier end of the investment spectrum including "value added" and opportunity funds where the investments often more closely resemble leveraged buyouts than traditional real estate investments. Certain investors in private equity consider real estate to be a separate asset class. Infrastructure: investments in various public works (e.g., bridges, tunnels, toll roads, airports, public transportation and other public works) that are made typically as part of a privatization initiative on the part of a government entity. Energy and Power: investments in a wide variety of companies (rather than assets) engaged in the production and sale of energy, including fuel extraction, manufacturing, refining and distribution (Energy) or companies engaged in the production or transmission of electrical power (Power). Merchant banking: negotiated private equity investment by financial institutions in the unregistered securities of either privately or publicly held companies. The seeds of the US private equity industry were planted in 1946 with the founding of two venture capital firms: American Research and Development Corporation (ARDC) and J.H. Whitney & Company. Before World War II, venture capital investments (originally known as "development capital") were primarily the domain of wealthy individuals and families. ARDC was founded by Georges Doriot, the "father of venture capitalism" and founder of INSEAD, with capital raised from institutional investors, to encourage private sector investments in businesses run by soldiers who were returning from World War II. ARDC is credited with the first major venture capital success story when its 1957 investment of $70,000 in Digital Equipment Corporation (DEC) would be valued at over $355 million after the company's initial public offering in 1968 (representing a return of over 500 times on its investment and an annualized rate of return of 101%). It is commonly noted that the first venture-backed startup is Fairchild Semiconductor (which produced the first commercially practicable integrated circuit), funded in 1959 by what would later become Venrock Associates. The first leveraged buyout may have been the purchase by McLean Industries, Inc. of Pan-Atlantic Steamship Company in January 1955 and Waterman Steamship Corporation in May 1955 Under the terms of that transaction, McLean borrowed $42 million and raised an additional $7 million through an issue of preferred stock. When the deal closed, $20 million of Waterman cash and assets were used to retire $20 million of the loan debt. Similar to the approach employed in the McLean transaction, the use of publicly traded holding companies as investment vehicles to acquire portfolios of investments in corporate assets was a relatively new trend in the 1960s popularized by the likes of Warren Buffett (Berkshire Hathaway) and Victor Posner (DWG Corporation) and later adopted by Nelson Peltz (Triarc), Saul Steinberg (Reliance Insurance) and Gerry Schwartz (Onex Corporation). These investment vehicles would utilize a number of the same tactics and target the same type of companies as more traditional leveraged buyouts and in many ways could be considered a forerunner of the later private equity firms. In fact it is Posner who is often credited with coining the term "leveraged buyout" or "LBO"
The leveraged buyout boom of the 1980s was conceived by a number of corporate financiers, most notably Jerome Kohlberg, Jr. and later his protégé Henry Kravis. Working for Bear Stearns at the time, Kohlberg and Kravis along with Kravis' cousin George Roberts began a series of what they described as "bootstrap" investments. Many of these companies lacked a viable or attractive exit for their founders as they were too small to be taken public and the founders were reluctant to sell out to competitors and so a sale to a financial buyer could prove attractive. Their acquisition of Orkin Exterminating Company in 1964 is among the first significant leveraged buyout transactions. In the following years the three Bear Stearns bankers would complete a series of buyouts including Stern Metals (1965), Incom (a division of Rockwood International, 1971), Cobblers Industries (1971), and Boren Clay (1973) as well as Thompson Wire, Eagle Motors and Barrows through their investment in Stern Metals. By 1976, tensions had built up between Bear Stearns and Kohlberg, Kravis and Roberts leading to their departure and the formation of Kohlberg Kravis Roberts in that year. In January 1982, former United States Secretary of the Treasury William Simon and a group of investors acquired Gibson Greetings, a producer of greeting cards, for $80 million, of which only $1 million was rumored to have been contributed by the investors. By mid-1983, just sixteen months after the original deal, Gibson completed a $290 million IPO and Simon made approximately $66 million. During the 1980s, constituencies within acquired companies and the media ascribed the "corporate raid" label to many private equity investments, particularly those that featured a hostile takeover of the company, perceived asset stripping, major layoffs or other significant corporate restructuring activities. Among the most notable investors to be labeled corporate raiders in the 1980s included Carl Icahn, Victor Posner, Nelson Peltz, Robert M. Bass, T. Boone Pickens, Harold Clark Simmons, Kirk Kerkorian, Sir James Goldsmith, Saul Steinberg and Asher Edelman. Carl Icahn developed a reputation as a ruthless corporate raider after his hostile takeover of TWA in 1985. Many of the corporate raiders were onetime clients of Michael Milken, whose investment banking firm, Drexel Burnham Lambert helped raise blind pools of capital with which corporate raiders could make a legitimate attempt to take over a company and provided high-yield debt ("junk bonds") financing of the buyouts. One of the final major buyouts of the 1980s proved to be its most ambitious and marked both a high water mark and a sign of the beginning of the end of the boom that had begun nearly a decade earlier. In 1989, KKR closed in on a $31.1 billion takeover of RJR Nabisco. It was, at that time and for over 17 years, the largest leverage buyout in history. The event was chronicled in the book (and later the movie), Barbarians at the Gate: The Fall of RJR Nabisco. KKR would eventually prevail in acquiring RJR Nabisco at $109 per share, marking a dramatic increase from the original announcement that Shearson Lehman Hutton would take RJR Nabisco private at $75 per share. A fierce series of negotiations and horse-trading ensued which pitted KKR against Shearson and later Forstmann Little & Co. Many of the major banking players of the day, including Morgan Stanley, Goldman Sachs, Salomon Brothers, and Merrill Lynch were actively involved in advising and financing the parties. After Shearson's original bid, KKR quickly introduced a tender offer to obtain RJR Nabisco for $90 per share—a price that enabled it to proceed without the approval of RJR Nabisco's management. RJR's management team, working with Shearson and Salomon Brothers, submitted a bid of $112, a figure they felt certain would enable them to outflank any response by Kravis's team. KKR's final bid of $109, while a lower dollar figure, was ultimately accepted by the board of directors of RJR Nabisco. At $31.1 billion of transaction value, RJR Nabisco was by far the largest leveraged buyouts in history. In 2006 and 2007, a number of leveraged buyout transactions were completed that for the first time surpassed the RJR Nabisco leveraged buyout in terms of nominal purchase price. However, adjusted for inflation, none of the leveraged buyouts of the 2006–2007 period would surpass RJR Nabisco. By the end of the 1980s the excesses of the buyout market were beginning to show, with the bankruptcy of several large buyouts including Robert Campeau's 1988 buyout of Federated Department Stores, the 1986 buyout of the Revco drug stores, Walter Industries, FEB Trucking and Eaton Leonard. Additionally, the RJR Nabisco deal was showing signs of strain, leading to a recapitalization in 1990 that involved the contribution of $1.7 billion of new equity from KKR. In the end, KKR lost $700 million on RJR. Drexel reached an agreement with the government in which it pleaded nolo contendere (no contest) to six felonies – three counts of stock parking and three counts of stock manipulation. It also agreed to pay a fine of $650 million – at the time, the largest fine ever levied under securities laws. Milken left the firm after his own indictment in March 1989. On 13 February 1990 after being advised by United States Secretary of the Treasury Nicholas F. Brady, the U.S. Securities and Exchange Commission (SEC), the New York Stock Exchange and the Federal Reserve, Drexel Burnham Lambert officially filed for Chapter 11 bankruptcy protection. In July 2007, turmoil that had been affecting the mortgage markets, spilled over into the leveraged finance and high-yield debt markets. The markets had been highly robust during the first six months of 2007, with highly issuer friendly developments including PIK and PIK Toggle (interest is "Payable In Kind") and covenant light debt widely available to finance large leveraged buyouts. July and August saw a notable slowdown in issuance levels in the high yield and leveraged loan markets with few issuers accessing the market. Uncertain market conditions led to a significant widening of yield spreads, which coupled with the typical summer slowdown led many companies and investment banks to put their plans to issue debt on hold until the autumn. However, the expected rebound in the market after 1 May 2007 did not materialize, and the lack of market confidence prevented deals from pricing. By the end of September, the full extent of the credit situation became obvious as major lenders including Citigroup and UBS AG announced major writedowns due to credit losses. The leveraged finance markets came to a near standstill. As 2007 ended and 2008 began, it was clear that lending standards had tightened and the era of "mega-buyouts" had come to an end. Nevertheless, private equity continues to be a large and active asset class and the private equity firms, with hundreds of billions of dollars of committed capital from investors are looking to deploy capital in new and different transactions. Although the capital for private equity originally came from individual investors or corporations, in the 1970s, private equity became an asset class in which various institutional investors allocated capital in the hopes of achieving risk adjusted returns that exceed those possible in the public equity markets. In the 1980s, insurers were major private equity investors. Later, public pension funds and university and other endowments became more significant sources of capital. For most institutional investors, private equity investments are made as part of a broad asset allocation that includes traditional assets (e.g., public equity and bonds) and other alternative assets (e.g., hedge funds, real estate, commodities). a Recapitalization – cash is distributed to the shareholders (in this case the financial sponsor) and its private equity funds either from cash flow generated by the company or through raising debt or other securities to fund the distribution. 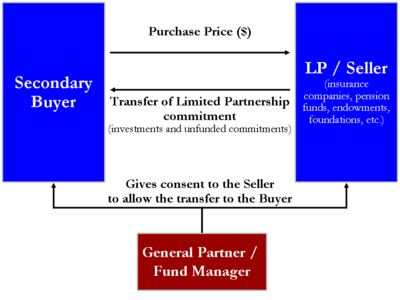 Diagram of a simple secondary market transfer of a limited partnership fund interest. The buyer exchanges a single cash payment to the seller for both the investments in the fund plus any unfunded commitments to the fund. The private equity secondary market (also often called private equity secondaries) refers to the buying and selling of pre-existing investor commitments to private equity and other alternative investment funds. Sellers of private equity investments sell not only the investments in the fund but also their remaining unfunded commitments to the funds. By its nature, the private equity asset class is illiquid, intended to be a long-term investment for buy-and-hold investors. For the vast majority of private equity investments, there is no listed public market; however, there is a robust and maturing secondary market available for sellers of private equity assets. Increasingly, secondaries are considered a distinct asset class with a cash flow profile that is not correlated with other private equity investments. As a result, investors are allocating capital to secondary investments to diversify their private equity programs. Driven by strong demand for private equity exposure, a significant amount of capital has been committed to secondary investments from investors looking to increase and diversify their private equity exposure. Investors seeking access to private equity have been restricted to investments with structural impediments such as long lock-up periods, lack of transparency, unlimited leverage, concentrated holdings of illiquid securities and high investment minimums. Sale of Limited Partnership Interests – The most common secondary transaction, this category includes the sale of an investor's interest in a private equity fund or portfolio of interests in various funds through the transfer of the investor's limited partnership interest in the fund(s). Nearly all types of private equity funds (e.g., including buyout, growth equity, venture capital, mezzanine, distressed and real estate) can be sold in the secondary market. The transfer of the limited partnership interest typically will allow the investor to receive some liquidity for the funded investments as well as a release from any remaining unfunded obligations to the fund. Sale of Direct Interests – Secondary Directs or Synthetic secondaries, this category refers to the sale of portfolios of direct investments in operating companies, rather than limited partnership interests in investment funds. These portfolios historically have originated from either corporate development programs or large financial institutions. Because private equity firms are continuously in the process of raising, investing and distributing their private equity funds, capital raised can often be the easiest to measure. Other metrics can include the total value of companies purchased by a firm or an estimate of the size of a firm's active portfolio plus capital available for new investments. As with any list that focuses on size, the list does not provide any indication as to relative investment performance of these funds or managers. Additionally, Preqin (formerly known as Private Equity Intelligence), an independent data provider, ranks the 25 largest private equity investment managers. Among the larger firms in that ranking were AlpInvest Partners, AXA Private Equity, AIG Investments, Goldman Sachs Private Equity Group and Pantheon Ventures. The European Private Equity and Venture Capital Association ("EVCA") publishes a yearbook which analyses industry trends derived from data disclosed by over 1, 300 European private equity funds. Finally, websites such as AskIvy.net  provide lists of London-based private equity firms. Fund of funds. These are private equity funds that invest in other private equity funds in order to provide investors with a lower risk product through exposure to a large number of vehicles often of different type and regional focus. Fund of funds accounted for 14% of global commitments made to private equity funds in 2006. Individuals with substantial net worth. Substantial net worth is often required of investors by the law, since private equity funds are generally less regulated than ordinary mutual funds. For example in the US, most funds require potential investors to qualify as accredited investors, which requires $1 million of net worth, $200,000 of individual income, or $300,000 of joint income (with spouse) for two documented years and an expectation that such income level will continue. As fundraising has grown over the past few years, so too has the number of investors in the average fund. In 2004 there were 26 investors in the average private equity fund, this figure has now grown to 42 according to Preqin ltd. (formerly known as Private Equity Intelligence). The managers of private equity funds will also invest in their own vehicles, typically providing between 1–5% of the overall capital. Often private equity fund managers will employ the services of external fundraising teams known as placement agents in order to raise capital for their vehicles. The use of placement agents has grown over the past few years, with 40% of funds closed in 2006 employing their services, according to Preqin ltd (formerly known as Private Equity Intelligence). Placement agents will approach potential investors on behalf of the fund manager, and will typically take a fee of around 1% of the commitments that they are able to garner. The amount of time that a private equity firm spends raising capital varies depending on the level of interest among investors, which is defined by current market conditions and also the track record of previous funds raised by the firm in question. Firms can spend as little as one or two months raising capital when they are able to reach the target that they set for their funds relatively easily, often through gaining commitments from existing investors in their previous funds, or where strong past performance leads to strong levels of investor interest. Other managers may find fundraising taking considerably longer, with managers of less popular fund types (such as US and European venture fund managers in the current climate) finding the fundraising process more tough. It is not unheard of for funds to spend as long as two years on the road seeking capital, although the majority of fund managers will complete fundraising within nine months to fifteen months. Over $90bn of private equity was invested globally in 2009, a significant fall from the $181bn invested in the previous year. The 2009 total was more than 70% down on record levels seen in 2007. Deal making however gathered momentum during the year with larger deals announced towards the end of 2009. With bank lending in short supply, the average cost of debt financing was up and private equity firms were forced to contribute a bigger proportion of equity into their deals. Indicators for the first half of 2010 show that investment activity totalled $55bn with private equity firms continuing to focus on investments in small and medium sized companies. The half-year total was up slightly on the same period in 2009 but well down on the period between 2005 and 2008. Full year figures for 2010 may show a moderate increase on 2009 if the gradual recovery in investments seen in recent months is sustained. Private-equity backed deals generated 6.3% of global M&A volume in 2009, the lowest level in more than a decade and down from the all-time high of 21% in 2006. This grew to 6.9% in the first half of 2010. Regional breakdown of private equity activity shows that in 2009, North America accounted for 36% of private equity investments, up from 26% in the previous year while its share of funds raised remained at around two-thirds of the total. Europe’s share of investments fell from 44% to 37% during the year. Its share of funds also declined, from 25% to 15%. While investments have fallen in most regions in recent years, there has been a rise in the importance of Asia-Pacific and emerging markets, particularly China, Singapore, South Korea and India. This is partly due to the smaller impact of the economic crisis on this region and better prospects for economic growth. Private equity funds under management totalled $2.5 trillion at the end of 2009 (Chart 3). Funds available for investments totalled 40% of overall assets under management or some $1 trillion, a result of high fund raising volumes between 2006 and 2008. Funds raised fell by two-thirds in 2009 to $150bn, the lowest annual amount raised since 2004. The difficult fund raising conditions have continued into 2010 with half-yearly figures showing a total of $70bn raised in the first six months, slightly below the same period in 2009. The average time taken for funds to achieve a final close more than doubled between 2004 and 2010 to almost 20 months and in some cases the final amounts raised were below original targets. Prior to the economic slowdown, the market saw intense competition for private equity financing. The three years up to 2009 saw an unprecedented amount of activity, during which more than $1.4 trillion in funds were raised. An oft-cited academic paper by professors at University of Chicago and MIT (Kaplan and Schoar, Journal of Finance, 2005) suggests that the net-of-fees returns to PE funds are roughly comparable to the S&P 500 (or even slightly under). This analysis may actually overstate the returns because it relies on voluntarily reported data and hence suffers from survivorship bias (i.e. funds that fail won't report data). One should also note that these returns are not risk-adjusted. However, it is challenging to compare private equity performance to public equity performance, in particular because private equity fund investments are drawn and returned over time as investments are made and subsequently realized. Two other findings in Kaplan and Schoar (2005): First, there is considerable variation in performance across PE funds. Second, unlike the mutual fund industry, there appears to be performance persistence in PE funds. That is, PE funds that perform well over one period, tend to also perform well the next period. Persistence is stronger for VC firms than for LBO firms. The application of the Freedom of Information Act (FOIA) in certain states in the United States has made certain performance data more readily available. Specifically, FOIA has required certain public agencies to disclose private equity performance data directly on the their websites. The main point of contention behind differentiating private equity from FDI is that FDI is used solely for production whereas in the case of private equity the investor can reclaim their money after a revaluation period and make speculative investments in other financial assets. Presently, most countries report private equity as a part of Foreign Direct Investment. 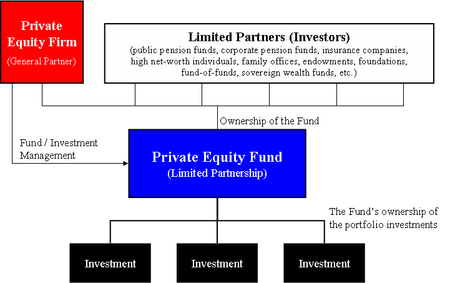 ^ Investments in private equity An Introduction to Private , including differences in terminology. ^ In the United Kingdom, venture capital is often used instead of private equity to describe the overal asset class and investment strategy described here as private equity. ^ Loewen, Jacoline (2008). Money Magnet: Attract Investors to Your Business: John Wiley & Sons. ISBN 978-0-470-15575-2. ^ Joseph W. Bartlett, "What Is Venture Capital?" ^ The Future of Securities Regulation speech by Brian G. Cartwright, General Counsel U.S. Securities and Exchange Commission. University of Pennsylvania Law School Institute for Law and Economics Philadelphia, Pennsylvania. 24 October 2007. ^ On 21 January 1955, McLean Industries, Inc. purchased the capital stock of Pan Atlantic Steamship Corporation and Gulf Florida Terminal Company, Inc. from Waterman Steamship Corporation. In May McLean Industries, Inc. completed the acquisition of the common stock of Waterman Steamship Corporation from its founders and other stockholders. ^ Marc Levinson, The Box, How the Shipping Container Made the World Smaller and the World Economy Bigger, pp. 44–47 (Princeton Univ. Press 2006). The details of this transaction are set out in ICC Case No. MC-F-5976, McLean Trucking Company and Pan-Atlantic American Steamship Corporation—Investigation of Control, 8 July 1957. ^ Taylor, Alexander L. "Buyout Binge". TIME magazine, 16 Jul. 1984. ^ Wallace, Anise C. "Nabisco Refinance Plan Set." The New York Times, 16 July 1990. ^ SORKIN, ANDREW ROSS and ROZHON, TRACIE. "Three Firms Are Said to Buy Toys 'R' Us for $6 Billion ." The New York Times, 17 March 2005. ^ Samuelson, Robert J. "The Private Equity Boom". The Washington Post, 15 March 2007. ^ Dow Jones Private Equity Analyst as referenced in U.S. private-equity funds break record Associated Press, 11 January 2007. ^ Dow Jones Private Equity Analyst as referenced in Private equity fund raising up in 2007: report, Reuters, 8 January 2008. ^ SORKIN, ANDREW ROSS. "HCA Buyout Highlights Era of Going Private." The New York Times, 25 July 2006. ^ Lonkevich, Dan and Klump, Edward. KKR, Texas Pacific Will Acquire TXU for $45 Billion Bloomberg, 26 February 2007. ^ SORKIN, ANDREW ROSS. "Sorting Through the Buyout Freezeout." The New York Times, 12 August 2007. ^ a b Private Equity Report, 2010 (PDF). TheCityUK. Cendrowski, Harry; Martin, James P.; Petro, Louis W. (2008). Private Equity: History, Governance, and Operations. Hoboken: John Wiley & Sons. ISBN 0-470-17846-9. Davidoff, Steven M. (2009). Gods at War: Shot-gun Takeovers, Government by Deal and the Private Equity Implosion. Hoboken: John Wiley & Sons. ISBN 0-470-43129-6. Maxwell, Ray (2007). Private Equity Funds: A Practical Guide for Investors. New York: John Wiley & Sons. ISBN 0-470-02818-6. Leleux, Benoit; Hans van Swaay (2006). Growth at All Costs: Private Equity as Capitalism on Steroids. Basingstoke: Palgrave Macmillan. ISBN 1-403-98634-7. Fraser-Sampson, Guy (2007). Private Equity as an Asset Class. Hoboken, NJ: John Wiley & Sons. ISBN 0-470-06645-8. Bassi, Iggy; Jeremy Grant (2006). Structuring European Private Equity. London: Euromoney Books. ISBN 1-843-74262-4. Thorsten, Gröne (2005). Private Equity in Germany – Evaluation of the Value Creation Potential for German Mid-Cap Companies. Stuttgart: Ibidem-Verl. ISBN 3-898-21620-9. Lerner, Joshua (2000). Venture Capital and Private Equity: A Casebook. New York: John Wiley & Sons. ISBN 0-471-32286-5. Grabenwarter, Ulrich; Tom Weidig (2005). Exposed to the J Curve: Understanding and Managing Private Equity Fund Investments. London: Euromoney Institutional Investor. ISBN 1-84374-149-0. Loewen, Jacoline (2008). Money Magnet: Attract Investors to Your Business. Canada, Toronto: John Wiley & Sons. ISBN 978-0-470-15575-2. This page was last modified on 4 May 2011 at 07:42.